Fashion Houston 2011 is in less than two weeks and I'm SOOO excited. Christian Siriano was in the inaugural lineup a year ago. We'll miss him this year. Anyway, he's in my thoughts today so here is my take on his show. Enjoiah! HEIGHTSTONIAN presents HOUSTON HOUSE Interior Designers: Kristen Johnson, Richard Sanchez, Saba Jawda, and Chris Nguyen. All were asked to design the interior of specific apartment homes for Houston House, which is undergoing $10 million in renovation. See the redesigned units on display through October 2, 2011. Sept. 23, 11 a.m. - 1 p.m. // Sept. 24 - 25, 1 - 5 p.m. // Sept. 30, 11 a.m. - 1 p.m.Oct. 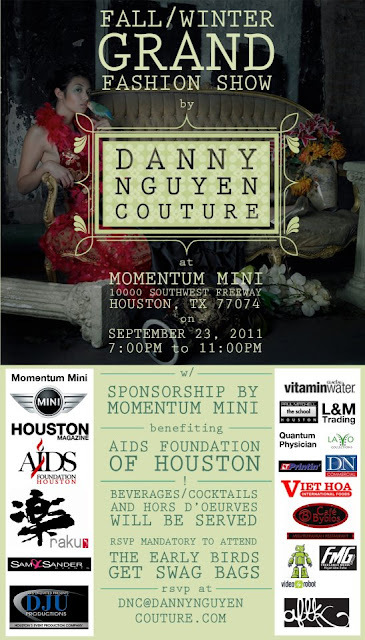 1 - 2, 1 - 5 p.m.
HEIGHTSTONIAN presents Houston's own Danny Nguyen Fall/Winter 2011. Consider my version a rough edge on the elegance that Nguyen creates. Music (in my video) by Houston DJ Gracie Chavez. Catch her at BomBon in Houston, TX. and on facebook for more details. Enjoiah! This was a HUGE thrill for me as a Houston fashion "Tracker!!!" I attended the Houston Vintage market in the Houston Heights (aka my playpen) Saturday afternoon, where Lindsay Halpin, the woman behind VIOLET PEACOCK was marketing her pieces, many of which she made specifically for the event. I've been following Violet Peacock for quite a while now and was so grateful she took the time to chat with me about this special day of "firsts" for her. A fashion show at the vintage market was the first actual runway presentation of her beautiful hat and 'fascinator' collection. A couture collection entitled "Velocity" was modeled by Neil Hamil models that evening. She also tells me, I'm the "first to do a story on her." She shared a bit about about how she works, what inspired the collection, & why she takes the time to do things by hand. In the freeze frame below, Halpin holds one of her favorite pieces. Enjoiah!! HEIGHTSTONIAN Nabs AL PACINO in Houston!! HEIGHTSTONIAN plays paparazzi!! I caught the "AL PACINO One Night Only" featuring the legendary actor at Jones Hall Monday night, where he spoke for almost 3 hours about acting, & shared many details about the incredible journey of his legendary career. He even performed prose and took questions from the audience. At one point, he exclaimed "isn't anyone going to ask me about my love life?!?!" Finally, to find myself standing in front of Al Pacino, was so ultimate! In fact, he and I are already on a first name basis, as you will see here. I like to think his last sweet wave was for me when I yelled "we love you Al. We love you." NewsFix Houston is airing it tonight on their news broadcasts at 5 & 9 p.m., but it won't likely air in its entirety, so to see it all, press play. Enjoiah!! A prestigious panel of judges from Houston's prestigious film and art community collectively awarded me, Rachel Estrada, the top video honor of Best Music Video at the Senorita Cinema Film Festival, led by Stephanie Saint Sanchez. The now award winning music video, features "Possessed By the Beat" a song by music artist MaxXandaux, produced by Houston producer extraordinaire BL ACK CAT. The distinguished panel of judges included native Houstonian Alfred Cervantes, Deputy Director of the Houston Film Commission. Another judge was producer and director, Mary Lampe, Executive Director of Southwest Alternate Media Project. Lampe also serves on various grant panels around Texas. Another judge was Dr. Tish Stringer, anthropologist and media maker, film lecturer and Film Program Manager at Rice University Department of Visual and Dramatic Arts is also the Film and Video Tech. Executive Director of Lawndale Art Center, Christine Jelson West was also on the judging panel. West, also a native Houstonian has a long history of working with the Orange Show Center of Visionary Art; Texas Visual Art Online and like Lampe, West serves on various art boards around the state. Academic and independent media consultant, Margarita de la Vega-Hurtado, was also on the panel. Vega-Hurtado spent several years as the Executive Director of Flaherty International Film Seminars. Judges said "it moved well." One said "during the screening, the judges couldn't take their eyes off of it." It was nice to have MaxXandaux (right above) on site to share the joy of my winning moment.